Some of the fastest growing cities in the world are in sub-Saharan Africa and South Asia. These rapidly expanding cities are often in regions with few financial resources to manage urban growth. The result of this fast expansion is that instead of increasing population density by growing upwards through taller buildings these cities often expand outwards. This unplanned rapid expansion can consume valuable land and natural resources. It can also result in people living in areas without proper sanitation and other public services. 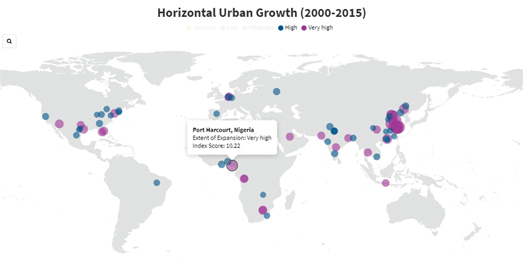 In Too Many Cities Are Growing Out Rather than Up the World Resources Institute explores where cities are experiencing horizontal urban growth rather than vertical growth. The article includes an interactive map which visualizes the cities around the world which are experiencing vertical growth, those experiencing the highest horizontal growth and the projected growth of cities around the world from 2015 to 2030. The World Resources Institute article also includes a link to download their full report into Upward and Outward Growth around the world. This report includes an explanation of how they used NASA data and data from other sources to determine urban growth around the world. The report also includes detailed maps exploring urban growth in a number of cities and where residents in these cities have inequitable access to public services.